5th May – Easter is coming! Judging by the heading of this article, you might probably think that it is slightly belated or irrelevant. Or you simply have already found all the Easter eggs hidden in your garden and eaten up the huge variety of chocolate products available for Easter. Not so fast friends! There is more to celebrate (or at least to read about)! First and foremost for those of you around the European continent, who are Christian Orthodox. But also for our audience, being willing to enrich itself and extend individual outlooks every single day – regardless its religious affiliation. Easter in the Orthodox tradition is waiting for us on the 5th of May this year. Yes, the date is different from for other Christians. And yes, it’s quite late this year. To avoid some misunderstandings, here are a couple of simple facts about it. The reason why some Christians (though believing in the same God) celebrate Easter (as well as Christmas for example) on dates different from others is quite trivial – we follow different calendars. Basically, it’s all about counting. Western churches use the “modern calendar” – Gregorian, being a standard for much of the world. Orthodox, on the contrary, stick to the older (also claimed to be the genuine one) – Julian calendar. The difference is only 2 weeks. Now, you might argue – this does not apply for Easter, since it is not a set date. Well, yes, but here we face another dissimilarity – the “counting formula”. Though it remains every year the same – “the first Sunday after the first full moon following the spring equinox”, the two churches “succeeded” in interpreting this relatively unambiguous term differently. Along with the astronomical perception (as the orthodox do) you can apparently also create your own table or calendar where you set your own “full moon” (as the “western” church does). Fascinating, how much various formalities and sticking to traditions still rule whole areas of social life. Now, which countries actually are predominantly orthodox and celebrate Easter this year on the 5th of May? In fact, there are quite a few of them – Belarus, Bulgaria, Cyprus, Georgia, Greece, Macedonia, Moldova, Montenegro, Romania, Serbia and Ukraine. Moreover, there are a couple of other European countries with a significant Orthodox Christian percentage. What is interesting, however, is the way of celebrating it and the main attributes of this holy feast in some Christian Orthodox countries. I will take as an example Ukraine – the country I come from myself and know Easter traditions quite well. One of the first things that might come to your mind when you think of Easter symbols is most probably the EGG. This is also the case in Orthodox tradition. However, it’s not a chocolate egg in this case. 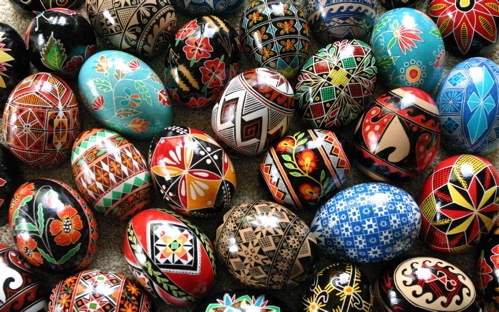 In Ukraine it is the Pysanka – an egg designed using beeswax techniques with national folk motifs on it. This art is considered to exist from ancient times given the fact that the egg was always the symbol of life, eternity, sun and universe. Worth mentioning is the philosophy behind the Pysanka in Ukraine – its ornaments, patterns and geometric drawings carry a vivid symbolism. Every single colour, curl, dot, line, spiral and figure has a special meaning. Thus, by creating a Pysanka – you automatically communicate a particular message. 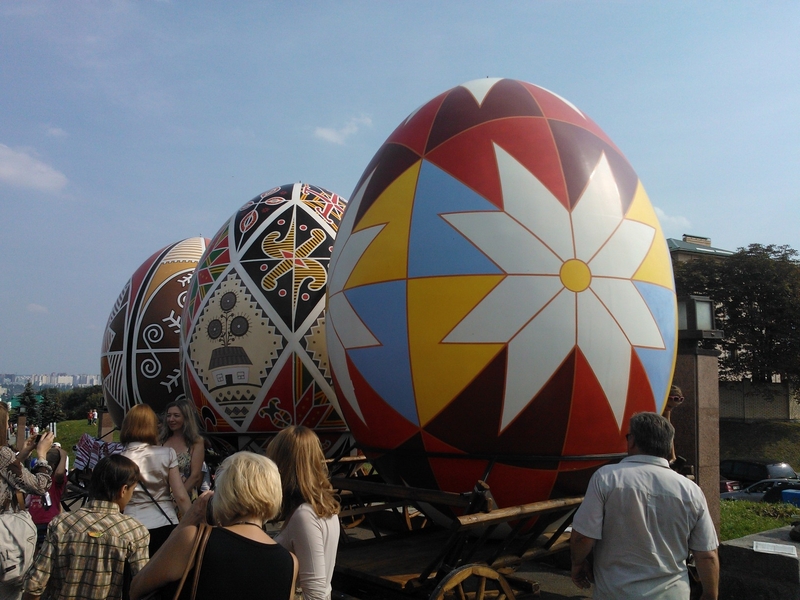 These Ester eggs are so popular in our culture that there is even a Pysanka museum in West Ukraine and giant Pysankas at various traditional festivities (see pictures). 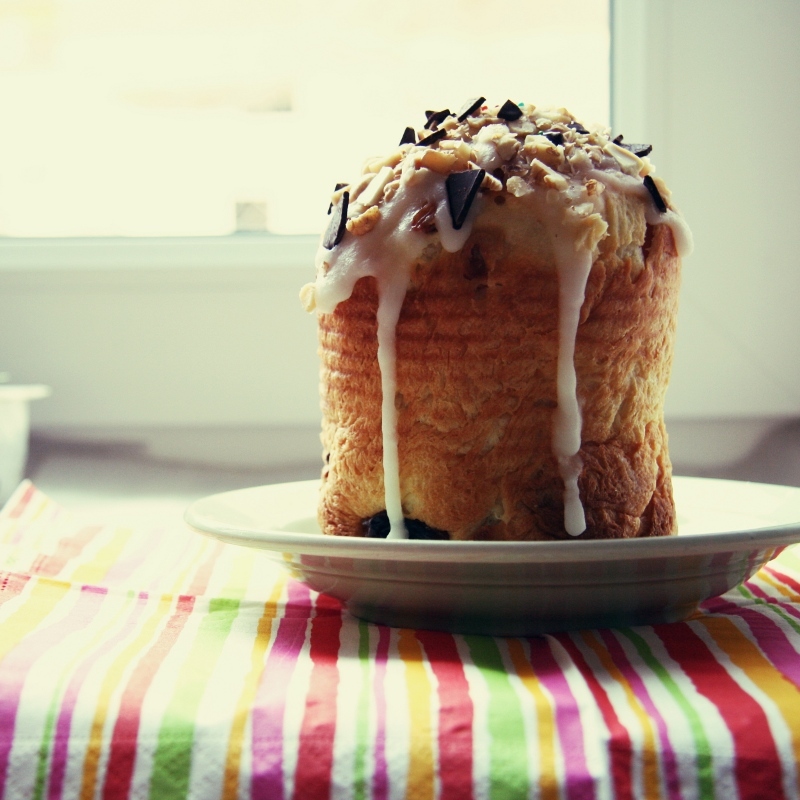 Another must have on Easter is the Paska – a traditional Easter bread, mostly sweet – with raisins, cottage cheese, sugar, cream and sometimes rum inside. A very delicious cake you have to try some day! Naturally, there is so much more to know about traditions in Ukraine, or generally in the Christian Orthodox world, for Easter – like carrying baskets (filled with various food) to the church to sanctify it with sacred water, or the so-called “egg fight” played at the festival table (everyone picks one egg and tries to beat all others’ eggs) and many, many more. However, what really matters in the end – whether it is Western or Orthodox Christianity (it’s the same religion after all) – is the general state of integrity, peace, compassion and love – traditional values we have to stick to and propagate. And Easter is just the perfect reminder of the crucial and genuinely important things in our lives. Therefore, fellow readers, I wish you a happy Easter – let serenity, contentment and harmony settle your soul! Brexit: Should Visegrád countries fight for free movement of workers? Slovakia’s Anti-Gay Referendum: Will Political Apathy Save Democracy? Cool, I did not know this! Happy Eastern! Love the motives on the eggs with secret meanings! The discrepancy between the Julian and the Gregorian calendars is interesting, also because it keeps growing! The Gregorian calendar, introduced in 1582, has since then ommited three leap years, which the Julian calendar had, and which are the reason for its growing mismatch with the astronomical seasons. The Julian calendar creates roughly one surplus day every century. Interestingly, when it was abolished by Pope Gregory XIII in the 16th century, until the time it should’ve created around 13 surplus days, but it only produced 10! This is one of the clues of the “Phantom time” theory, which says that three centuries in the medieval times did never exist! Nice article. What I want to add on this article is, Ethiopia(east Africa) country have an oldest & big Orthodox Christians community(more than 40 million). But I don’t know why it never mention before or known by the world Christian orthodox community. Quite interesting article. Though, one question is still being ignored – why Russia, the world largest Orthodox community is not mentioned at all??!! Is there any good reason for doing that, Olesia? Dear Michael and Samu,thank you for your comments. I want to draw your attention to the fact,that this blog is dedicated to European affairs. Since I don’t consider Ethiopia and Russia to be European countries – this article did not deal with them. However,nobody denies the fact that Russia has the biggest Orthodox community,neither that this religion is represented on other continents.